Progress is, no one can deny, a good thing. 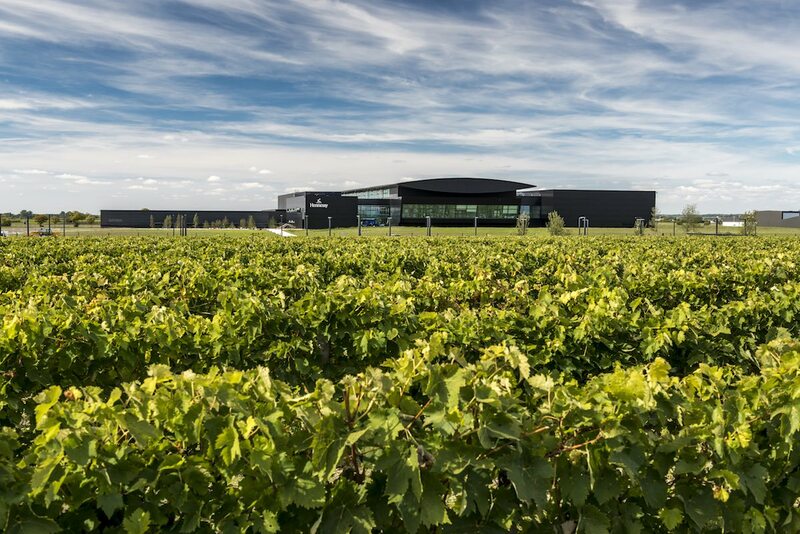 But at the risk of bemoaning the fact that technology is removing the human touch from our world, we have mixed thoughts about the opening of the new gigantic Hennessy bottling plant in the heart of the Cognac countryside. It could be an airport! It’s enormous. 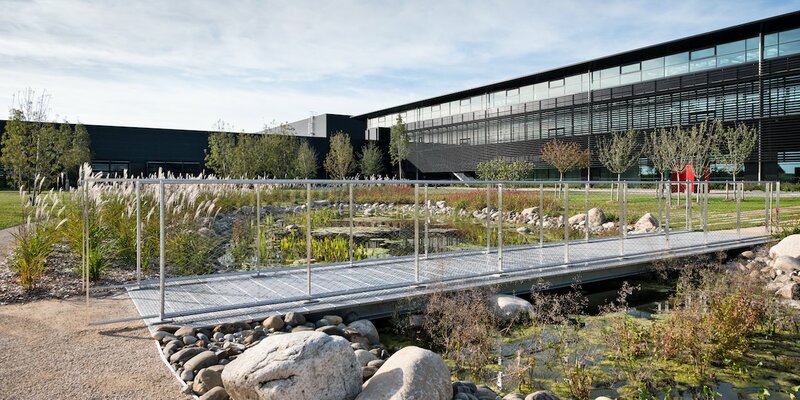 Covering 26,000sq m in Pont Neuf just outside of the town of Cognac, the building was 2 years in the making and cost LMVH (the parent company of Hennessy) multi-millions to create. And forget just the building itself; the complete site covers an eye-wateringly massive 30 hectares (74 acres). The plant was proudly inaugurated at the end of October 2017 by Chairman and CEO of LMVH, Bernard Arnault, along with newly appointed Moet Hennessy CEO, Philippe Schaus, President of Hennessy Cognac, Bernard Pellion, and the Secretary of State to the Minister of Europe and Foreign Affairs, Jean-Baptiste Lemoyne. The all-men lineup itself has a little bit of a bad aftertaste in our view. Green building triumph or a blot on the landscape? We have to say, top marks to LMVH for creating a truly ‘green’ building. It’s state of the art sustainable architecture, built using cutting edge technology with HQE high environmental quality certification. That’s all well and honorable, but is it merely a way to distract from the fact that this plant is a disaster for small business in the region? 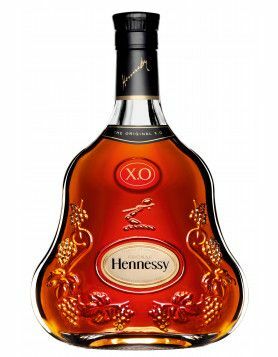 Imagine how many small bottling companies, suppliers, producers, and workers have lost Hennessy as a client just so that the giant can save millions by cutting out the middle man? Is this really what the biggest house in Cognac should be doing to the land that is the cradle of all its wealth? Let’s face it, LMVH (and therefore Hennessy) exists for a single reason: and that is to make a profit. So the investment into such a bottling plant makes perfect sense. This facility will allow them to increase their output to around eight million cases per year by 2018. For the world’s number 1 Cognac producer, it makes sound economic sense. But what does this mean for the little guy? And by ‘little guy’, we mean the small vineyard owners and artisan Cognac producers who, year by year, face more and more challenges to compete against the might of large companies such as Hennessy. The list goes on of people who are directly hit by this: bottle suppliers, the label printers, the packaging companies, etc etc. We’re another step down the road towards these small operations simply being swallowed up the big Cognac corporations. Is the age of sci-fi upon us? We’ve all seen those movies where every single one of us lives under the umbrella of an ‘uber-management’. 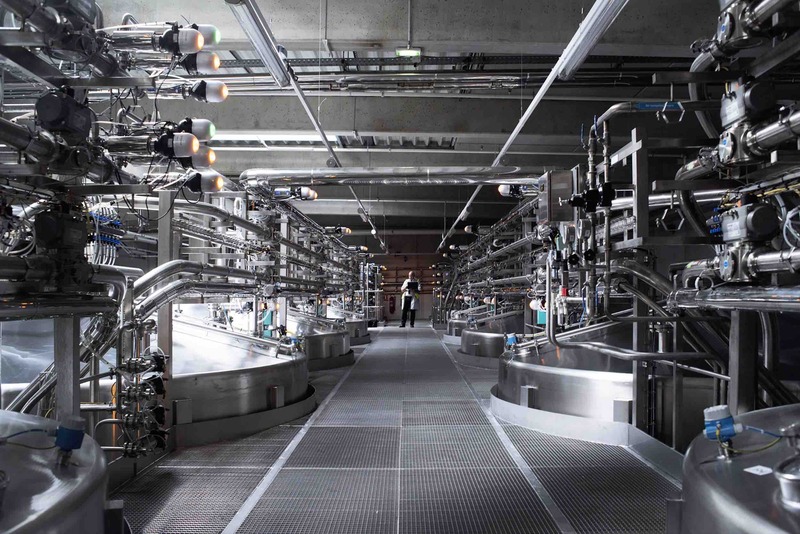 And we’re not trying to be over-dramatic saying that the simple opening of Hennessy’s bottling plant means the world is moving in that direction. But if you’re a struggling Cognac farmer, tending your few hectares of vines to continue the tradition of your forefathers, then the ever-moving forward long-term vision of LMVH to continue to pour mega-billions into the Hennessy economy must give you cause for concern. Sure, Hennessy does provide a massive infrastructure for employment in the region, we’re not taking away from them for that. But at what point does the small producer throw up his hands and bow to the might of the No 1 Cognac in the world, and simply agree to sell their eaux-de-vie to the giant to produce under their own label? The farmer continues to make money-and perhaps a more guaranteed income. 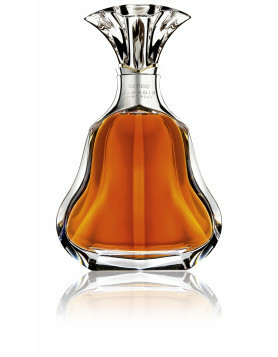 But what they (and the Cognac drinker) lose, is another small brand to discover, display, and enjoy. 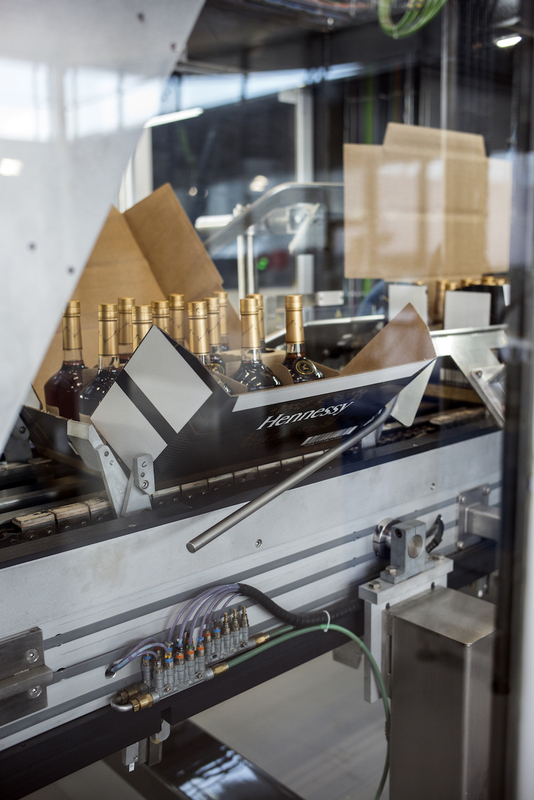 What are your thoughts on Hennessy’s new bottling plant? Are you happy to see progress such as this? After all, Hennessy is the world’s most enjoyed Cognac. So if you’re half way around the world, wouldn’t you be happy that there’s a chance of a more plentiful supply of what might be your favorite Cognac? Or do you too have a nagging feeling in the pit of your belly that it’s just another corporation gently edging (or rudely shoving) out the little man. Over to you, our Cognac Expert readers. It’s time for you to have your say. 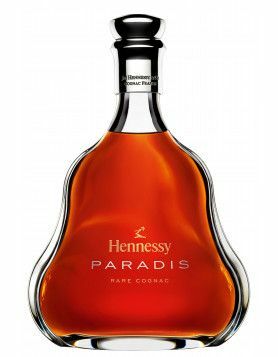 Learn more about Hennessy and their wide range of Cognacs. 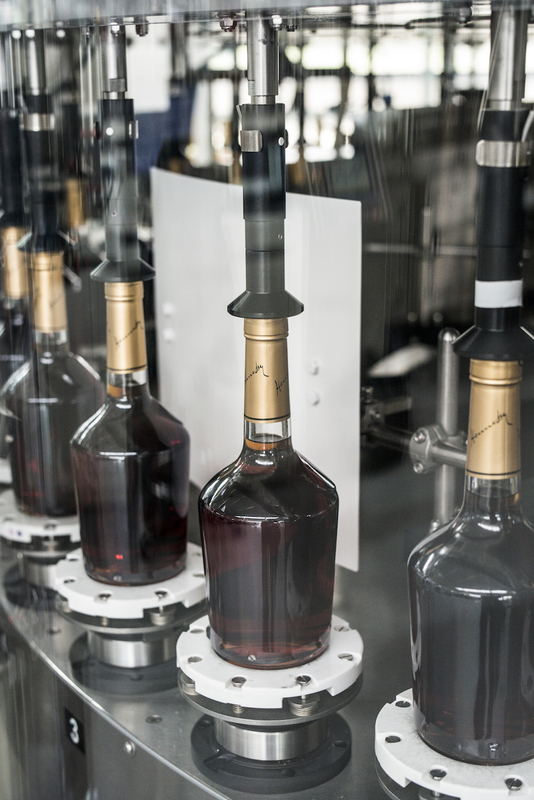 A bottling plant mass producing millions of litres of Cognac for mass consumption will have its market selling highly price inflated brew produced under supervision of Chemists, Engineers and Scientists. Besides making a lot of money selling this hooch for LMVH, it will make other corporations like DHL, and fancy Duty free shops richer. The small Cognac producers who use hundred plus of years of knowledge and expertise to produce rare hand crafted Cognac using the highest standards will only become more unique, and hence command a higher price from connoiseurs of the spirit, a lot of whom will switch brands to more authentic Cognac.